I so wanted to say that this is “a novel of epic proportions” somewhere in this review, but it would cheapen such a wonderful, touching story. It’s more than that. “The Little Giant” is about humanity and emotion and adversity and humility and integrity and life. It’s about everything. Truly, the main character, is shunned by her community because of her extraordinary size. However, her resiliency, her humanity, her perseverance — and, importantly, her attitude — make her not a pitiful creature but a character you can sympathize with and root for. You simply want Truly to triumph; after all, she is the one person with whom you cannot find fault or flaws. She has a pure heart and mind, and forges through life in spite of the cruelty and obstacles she is subjected to as a result of her size. This book would be perfect for a reading group or for discussion among friends. It is bursting at the seams with metaphors and themes that are just begging to be hashed out and analyzed — the concept of beauty being the most obvious, of course, but there are many more. 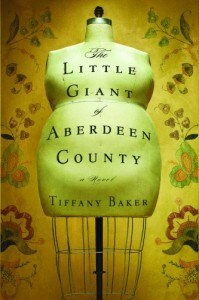 “The Little Giant” is a novel you won’t want to put down. It’s certainly one that will grab your attention and bring you along for an interesting and, at times, difficult (difficult as in harsh reality and emotionally involved) ride. You won’t regret picking up this book and it is appropriate for all ages, which is a big plus. Wasn’t this just a magical, wonderful book? You’re right – I feel lucky to have read it, and to be in the “club” of people that have.